An Evening with Geoff Billington. Portmore Equestrian Centre Host a Master Class with the Olympic Showjumper. He’s back again and sure to bring an evening full of entertainment as Olympic showjumper, Geoff Billington returns to Portmore Equestrian Centre on Saturday 2 February 2019 at 7pm, in association with Bluegrass Horse Feeds. 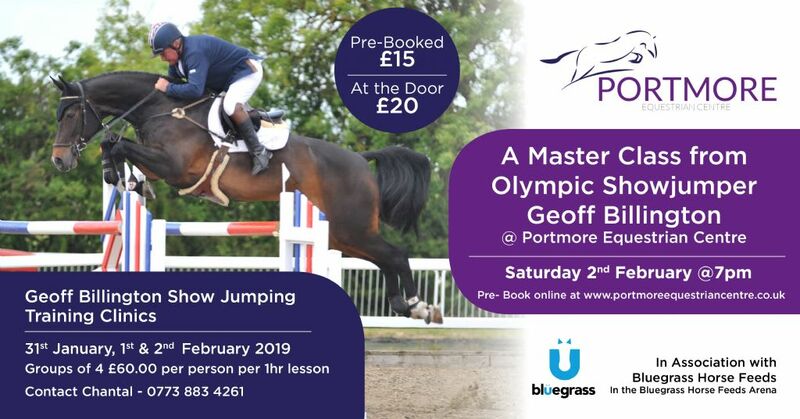 Renowned Olympic showjumper, Geoff Billington will be travelling to Portmore Equestrian Centre, Aghalee, for a masterclass you don’t want to miss. The evening will be spilt into two themes; the first part will focus on “improving your riding”, with demo riders who will no doubt be the blunt of Geoff’s witty humour. Geoff will then ride in the second part, “doing it my way”, giving tips and tricks on his riding skills that has brought him such success. Geoff began riding when he was just nine years of age, after getting his first pony he started his now greatly successful career. At 19, Geoff competed in his first British Team competition in Poland on Joe Pullens horse, Talk of the North. His career began, and his success grew, having now competed in over 50 Nations Cups. The well-known partnership with “It’s Otto”, brought Geoff his success including; 6th individually in Atlanta Olympic Games 1996, team bronze at the European Championships on 1997, team bronze in Manheim 1998, bronze in the World Championships in Rome 1999, 6th in the European Championships at Hickstead and represented Britain at the Sydney Olympics in 2000. It’s Otto was awarded the “Outstanding Horse of 1996” and retired at Olympia in 2001. With such an impressive career this masterclass will be packed with knowledge for aspiring riders and coaches. We are delighted to announce the opportunity to receive a one hour lesson by Geoff for groups of four (£60.00 per person). These will be held on the 31st January, 1st and 2nd February at Portmore Equestrian Centre in the Bluegrass Horse Feeds arena. Booking is essential with limited spaces, contact Chantal to book your space – 07738834261. Pre-book your tickets online now for only £15.00 at www.portmoreequestriancentre.com.